A-arms are one of the most important, yet overlooked suspension components. They are the direct link between the front wheels and the chassis. Any deflection causes a change in alignment, which results in poor performance and driving feel. Fabricated from heavy-duty 1.25-inch, 0.095-inch wall DOM tubing with laser-cut, CNC-formed plate steel plate, deflection is eliminated with A-arms from BMR Suspension. 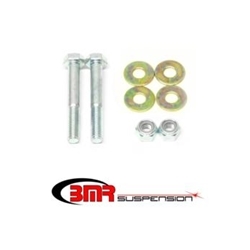 BMR’s AA010 Lower A-arms are equipped with greasable heavy-duty ball joints, 95-durometer polyurethane bushings (front mount), and greasable Delrin bushings (rear mount) to handle the high loads. Polyurethane bushings add a solid, more responsive feel over the stock rubber bushings. BMR’s bushings are internally fluted, which allows grease to evenly coat the inner sleeve. These flutes also direct grease to the outer edge of the bushing, keeping the thrust surface lubricated. This efficient lubrication ensures quiet, reliable operation over the life of the bushings. The combination of poly and Delrin bushings gives you improved steering feel and responsiveness for any for of driving. BMR’s AA010 lower A-arms eliminate A-arm deflection, greatly improving steering feel and response in normal and performance driving situations. The polyurethane and Delrin bushings add strength and reduce deflection over the stock rubber bushing, while still absorbing much of the NVH. The means you get a great blend of performance and comfort. Designed for street performance, drag race, and handling, and pro-touring applications, BMR lower A-arms are engineered to give you improved geometry and increased lateral grip during cornering situations. BMR Suspension AA010 Non-Adjustable Lower A-arms are available in black hammertone and red powdercoat for long-lasting good looks. Installation time is 3-4 hours. Proudly made in the U.S.A.
Control arm hardware kit RH014 (Includes upper and lower control arm hardware - Highly Recommended) also available.